Inspiration, education, and conversation The SCBWI’s 45th Annual Summer Conference was held at the beautiful, centrally located Biltmore Hotel in downtown Los Angeles. With almost 1,000 attendees representing 48 states and 15 countries, from the first moment it was apparent that this was the place for a children’s writer or illustrator to be. This year’s top-notch faculty shared everything from industry statistics to personal stories about their path to publication. The schedule packed in a variety of speakers including authors, illustrators, editors, agents, and other industry professionals. Each day had a lineup of speakers and an opportunity to choose from specialized workshops. The Biltmore Hotel was a lovely choice with its well-preserved period décor and comfortable chairs. There were many restaurants and cafes to explore at lunch time. Parking was easy—either at the hotel, or directly across the street at Pershing Square. Breaks and lunch were also a time to connect with your regional group, as each region had a set time and place to meet and mingle. What happens at these conferences? This three-day event kicked off with registration, coffee, and a new-attendee orientation. The day’s welcome was delivered by Executive Director, Lin Oliver, followed by the ~ 75 faculty members each saying one powerful word into the mic. Drew Daywalt took the stage as the opening keynote speaker; keynotes continued with Pam Muñoz Ryan and Justin Chanda. Attendees then selected their first workshop (from eleven options) and split off into the smaller conference rooms. A faculty bookstore was set up throughout the three days, for browsing and shopping. After lunch, the Editors Panel provided helpful industry insight; Jenni Holm’s keynote followed, then the day’s second workshop. Next, Golden Kite and On-The-Verge Emerging Voices Awards presentations, acceptance speeches, and dinner. Later that night: optional social gatherings and peer activities. Saturday morning began with yoga and coffee. The first keynote speaker was Jon Klassen. Marie Lu and Nancy Castaldo were next, then workshop groups. After lunch was Carole Boston Weatherford, a panel on picture book, and Neal Shusterman. This led to an autograph session, the portfolio showcase, and pre-gala happy hour events that included informal conversations with the faculty. The big event was the Red Carpet Ball. On Sunday, after guided mediation and coffee, the conference opened with the highly anticipated Agent Panel. Both the Editors Panel and the Agents Panel are popular because they allow attendees a chance to hear these professionals’ opinions side by side, learning that, like us, editors and agents have unique preferences and personalities. This helps us understand not just how to submit our work but which piece to submit to whom. Art award announcements were followed by Sophie Blackall’s keynote, then the morning workshops. At lunch on Sunday, a Member Book Sale allowed SCBWI members to support other members who displayed and sold their books. Afternoon workshops followed. Next was Deborah Halverson’s “Up-to-the-Minute Market Report,” then Ellen Hopkins’s keynote. Sunday concluded with “the one and only” Richard Peck, and a final autograph party. There was ample opportunity to find your niche, ask questions, and better understand how to proceed in your personal path to publication. Attendees could delve deeper with prescheduled one-on-one consultations, and focused intensives (on Monday). Attending conferences are worthwhile opportunities for writers and illustrators; SCBWI conferences are well-planned, top-quality events with something for everyone. It was a weekend of learning and making new friends. In our craft, we often work in isolation. At a conference, we find like-minded people with whom we can connect to share our experiences, complaints, and congratulations. This is your tribe, your community. Being there was heartwarming and rousing—a feeling that anything was possible, that you could do it. Ideas were born and friendships made. Speaking with other SCBWI attendees came naturally We wore lanyards with our names and hometowns; conversations were struck up while relaxing in the lobby, grabbing a coffee, or milling about the neighborhood. 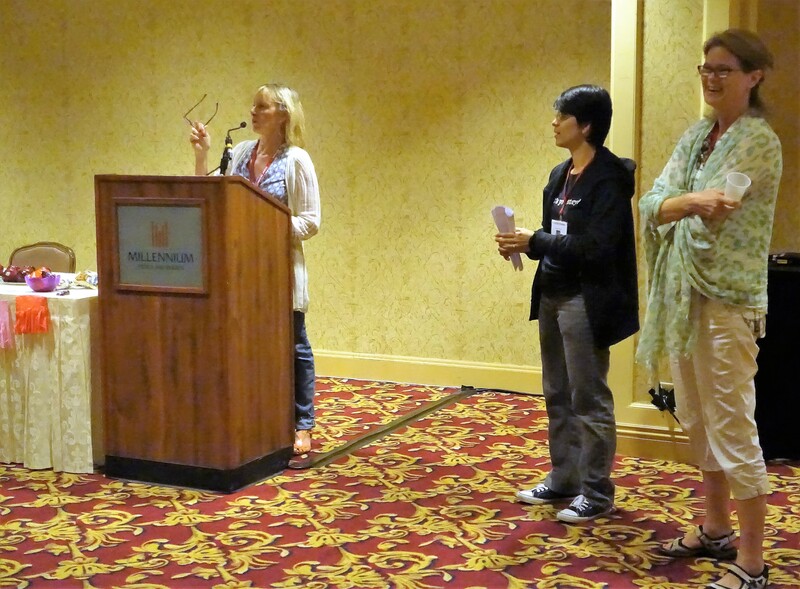 The SCBWI Annual Summer Conference was once again a not-to-be-missed event. I am thankful for being part of such a remarkable organization.